The Spoonbill is a beautiful white bird, which walks with stately step through ditches or swamps and moves its bill from side to side through the water. With its distinctive spoon-bill it gets its food out of the mud. 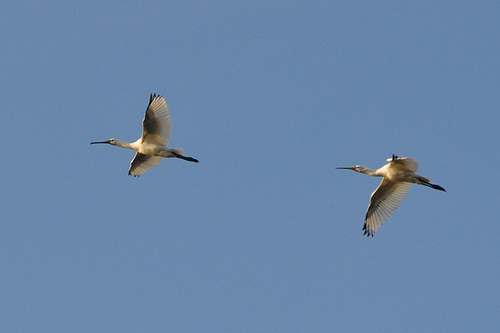 The Spoonbill breeds in colonies and sometimes suffers from foxes that hunt for their eggs or their young. 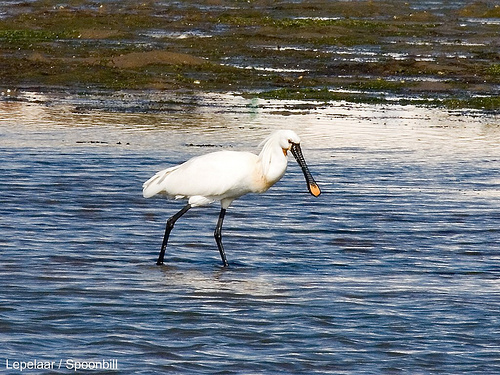 The Spoonbill has a distinctive broad bill. It keeps the neck extended while flying. The Great Egret folds back the neck during flight.